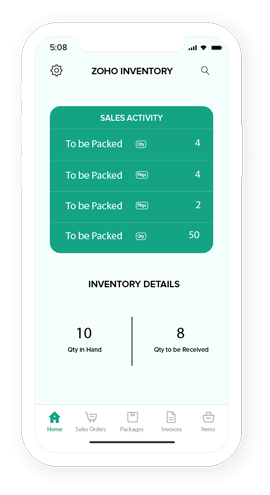 The precision inventory management system for businesses. Our seamless inventory system streamlines warehousing, order fulfillment, and reporting, keeping your item data secure at every stage. Entering item and customer information repeatedly while creating a sales order or invoice is always frustrating. Zoho Inventory captures all of the sale information at once, eliminating double data entry and enabling comprehensive reporting. Grouping items that share common attributes allows them to be analyzed and tracked efficiently. With item groups, you can combine items based on their characteristics and see each group's performance in just one click. Identifying every item or batch with a unique code while you are adding it allows you to trace its movement and expiration date at any time. When you're creating a sales order, invoice, or item adjustment, you can scan items with a barcode scanner to auto-fill their individual codes. Systemize every operation in your order management cycle. Create package slips from your confirmed sales orders, integrate with more than 30 major shipping carriers, and send real-time status notifications to customers after shipping each package. Set your mundane tasks on autopilot with automation rules. Get automatically reorder point notifications and avoid out-of-stock situations, or send personalized order confirmation emails to your regular customers. After you streamline your inventory process, it's important to monitor its performance. 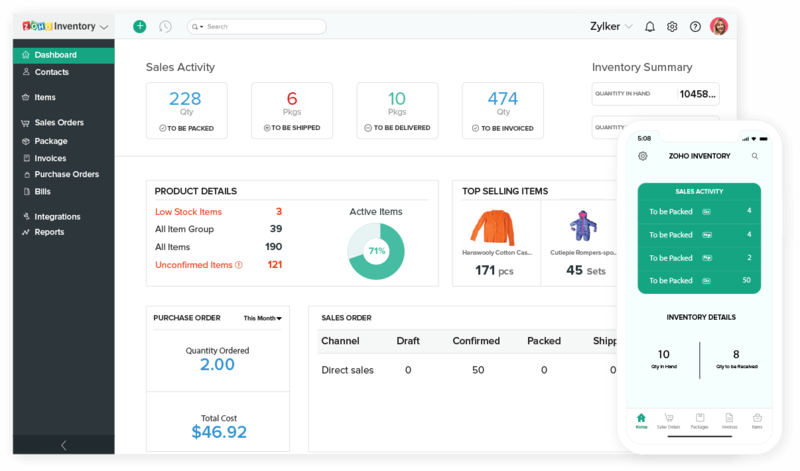 Run detailed reports with just a click to see your bestselling items, most valuable customers, or packing efficiency, so you can make quick, informed decisions every time. "I can store all my products, invoice and track shipping, payments, and delivery all in one location. It just makes the whole invoicing, sale right through to delivery process easier! And the integrations to various platforms"
Is it a cloud-based inventory management system? Can it be used in multiple devices? Yes, it is a cloud-based system. It is compatible with desktop, tablet and mobile phone(iOS). Can I integrate this application with different marketplaces? Can I get some assistance with regards to implementation, data migration or training the staff to use this system? Can I add more users and assign roles to them? Yes, you can add more users based on the pricing plan and create different roles. By creating roles, you can customize the usage permissions for each user. Does it integrate with any accounting software? It integrates with Zoho Books, a cloud-based application designed to handle all your accounting related needs. One of the most significant advantages of using Zoho Books is that you do not have to create a separate account to use it. Once you create an organization in Zoho Inventory, you can access Zoho Books from within the Zoho Inventory app. Not only that, all the information like Sales orders, invoices, item details, etc. get pulled in automatically, and all the figures get populated in the financial statements as well.